Hello everyone! Rounding up this last full week in August is a MASSIVE amount of events to keep you busy until September putting away your “there’s nothing to do here” blues. Starting this busy week will be an event hosted by the Roanoke Main Library downtown. 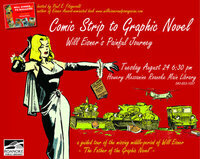 River Laker will present Comic Strip to Graphic Novel; Will Eisner’s Painful Journey. The event will consist of a panel discussion based around comic art and its move from the funny papers to full on volumes of graphic novels. The panel will put a special focus on the work of Will Eisner, beloved creator of The Spirit comics. The panel will consist of host and local Eisner biographer Paul E. Fitzgerald, Roanoke Times reporter/ former blogger Mason Adams and B&D Comics owner Terry Baucum. This event will take place Tuesday, August 24th on the Howery Mezzanine at 6:30pm. It is free to the public and light refreshments will be provided. 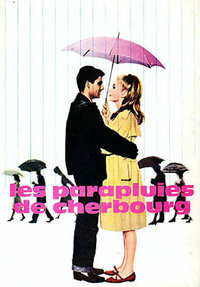 Continuing on to Wednesday the Shadowbox presents French film classic from 1966 “Umbrellas of Cherbourg”. The film stars Catherine Deneuve and Nino Castelnuovo with direction by Jacques Demy (“Lola”, “the Seven Deadly Sins”) . This film starts at 8pm. Friday (August 27th) the Shadowbox continues to show their love for great cinema by presenting one of Charlie Chaplin’s last silent films. 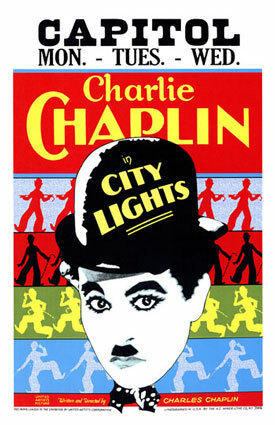 “City Lights” stars Chaplin in arguably his most famous role, the “Little Tramp”. Come out and witness this masterpiece from 1931. The film starts at 8pm. Also on Friday the Magic Twig Community’s the Young Sinclairs will be hosting a show in their own studio with Lynchburg friends, Steal the Prize. The show will take place around 9pm at the MTC’s Mystic Fortress on Cleveland. This show/ gathering is donation based so come out and help Steal the Prize put some gas in their tank! For those of you who can’t make it on Friday the Sinclairs will be joining Steal the Prize in Lynchburg on Saturday. The two groups will be performing at Rivermont Pizza around 7pm. Saturday join the Shadowbox in celebrating one of the greatest cult classics of all time. 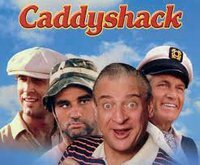 “Caddyshack” (starring Chevy Chase, Bill Murray and Rodney Dangerfield) has been a movie quoter’s favorite for a couple of decades now. Come out early to play 9 hole putt putt and don’t forget to dress up in your best golfing attire! Best outfit gets a prize! The evening starts at 7pm. 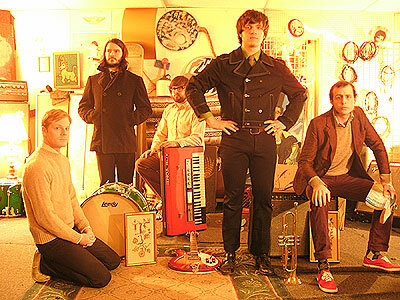 This Sunday Dickie and the gang will be throwing the last show at Happy’s Flea Market. Fear not though, Dickie has relocated his gallery to the corner of Kirk and 2nd downtown. 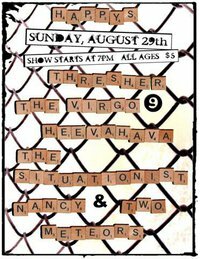 The Happy’s show will feature the Situationist, Nancy & Two Meteors, Heevahava, Thresher and the Virgo. Show starts at 7pm, is all ages and will only cost you $5! Ending the month of August will be a Shadowbox showing of Japanese horror film, “Audition”. Don’t miss this startling and cleverly crafted psychological drama from one of Japan’s best shock directors, Takashi Miike. The film shows Monday the 30th at 8pm. Have a great rest of your month and we will see you all in September!